Andrew Clayton (General Manager Ngāi Tahu Farming), Philip Colombus (farm manager), Jo and Shaun Back (group managers). Ngāi Tahu Farming’s 380 ha dairy farm near Oxford – Dairy Farm One – has been awarded the Environment Canterbury Water Quality Award at the regional Ballance Farm Environment Awards in Christchurch (held on Thursday March 20, 2014). 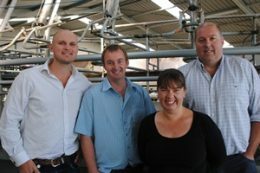 The farm – which has 1300 cows on a flat-contoured milking platform – is in its second year of production after forestry land was cleared between 2007 and 2011. The award judges described the property as an impressive large-scale dairy conversion with a clearly developed strategy and the impressive use of technology for monitoring. They also noted there had been extensive efforts to understand and minimise the impact of the farm business on water quality. Andrew Clayton, general manager of Ngāi Tahu Farming Ltd (a subsidiary of Ngāi Tahu Property Ltd), said local rūnanga have been involved throughout the development of the farm. Andrew said the farm’s close relationship with Lincoln University has also contributed to its success. The farm is in the process of having 40 lysimeter barrels installed – the largest number on any farm in New Zealand. The barrels contain cross sections of soil which allow water to percolate, which is analysed for nutrient leaching and leads to improved decision-making around efficient water use. The Whenua Kura education programme, involving Ngāi Tahu Property, Lincoln University and Te Tapuae o Rehua, is another example of the relationship between Lincoln University and the farms. Whenua Kura is designed to support more local Māori into agriculture, and will prepare students with the appropriate skills and value set. Other Lincoln students, studying environmental issues, are also working at the farm. These students take an active role in monitoring biodiversity enhancements and undertaking biological surveys. Environment Canterbury Commissioner Dame Margaret Bazley, who presented the regional award, said entrants needed to demonstrate they were aware of the impact their operation had on water quality, and to have taken deliberate steps to manage this. “Ngāi Tahu Farming has demonstrated that good and innovative farm management can also be good for business. “Environment Canterbury congratulates all entrants in these awards, and particularly Ngāi Tahu Farming, and for their vision and leadership to put new ideas into practice,” said Dame Margaret. The Dairy Farm One also won the Ballance Agri-Nutrients Soil Management Award.